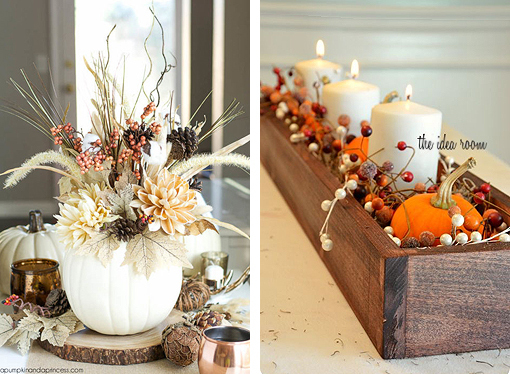 Beautiful table decorations and centerpieces don't have to be expensive. 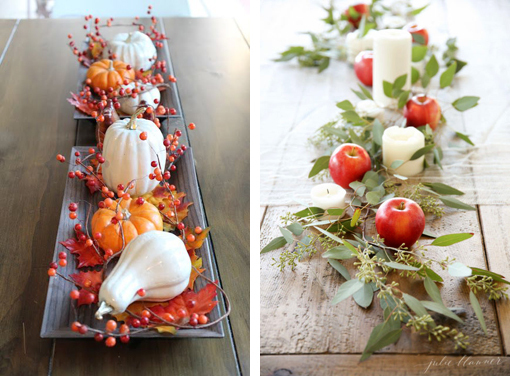 With a little creativity and these ideas to spark your imagination you'll be on your way to a gorgeous seasonal table! When choosing decorations for your dining table think narrow. You want the table to look great, but be sure to leave lots of space for eating. Don't let your decorations get in the way of the festivities. It's also best to keep things low so diners don't have to look 'around' the decorations to converse with each other. These small white pumpkins are gorgeous and they are paired with foliage that is dark and contrasts well. 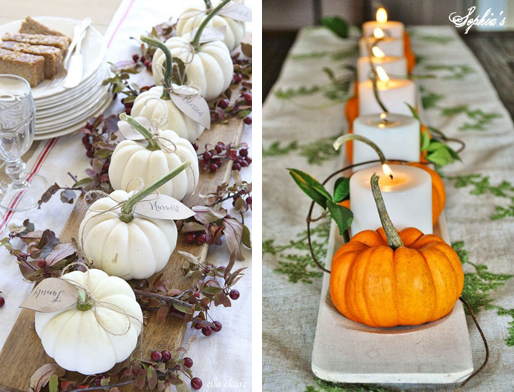 The small orange pumpkins are paired with simple white candles. When using real pumpkins, such as these, be sure to place the decorations on something you won't mind getting messed up in case the bottoms should 'leak'. Something as simple as a piece of wood or at least wax paper will protect your table or fabric runner. I love the look of the apples and greenery. It is amazing how wonderful a bag of apples and some greenery (probably from bushes) plus (dollar store) white candles can look. 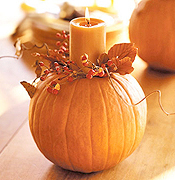 If you more of a 'centerpiece' this white pumpkin filled with natural-looking items is very elegant. 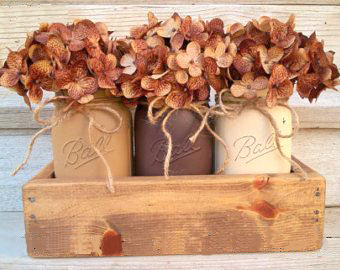 This simple idea uses leaves and acorns to make a lovely display. Use varying heights and groups of 3 to make a display like this pleasing. 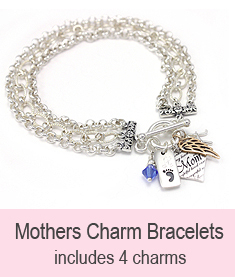 This piece has a more rustic feel but is just as beautiful. You can create this for just about any color scheme. 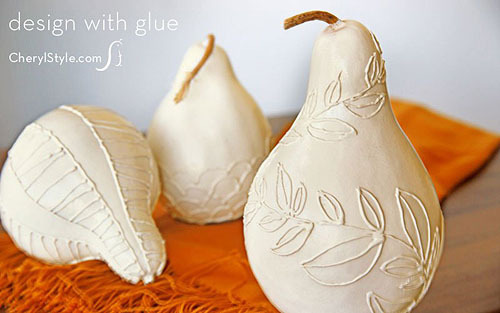 A great idea for creating your own amazing look is this gourd. A pattern was drawn on in pencil then hot glue was used to make the design. Once the glue is completely dried, just paint! 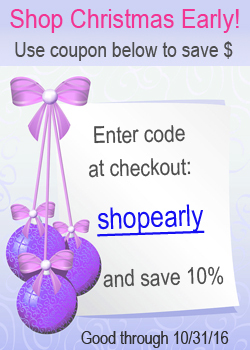 You can find the instructions here, at everydaydishes. 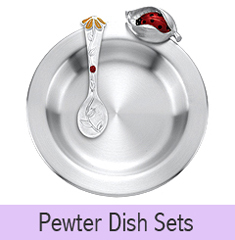 All of these ideas are wonderful and can be adapted to your table with little expense. 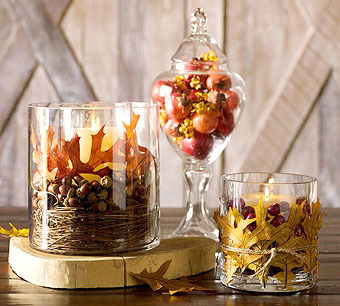 Now the hardest thing you will encounter is deciding which idea you like best for your fall table! Which one is your favorite?